That’s because Ringling Bros. and Barnum & Bailey have completely reimagined the modern circus experience with their boldest production ever, Out of This World. Gone are the elephants, replaced by start-of-the-art visual effects, a seamless flow of breathtaking, never-before-seen performances and — for the first time ever — a character-driven storyline. So what kind of spectacle can you and your family expect? 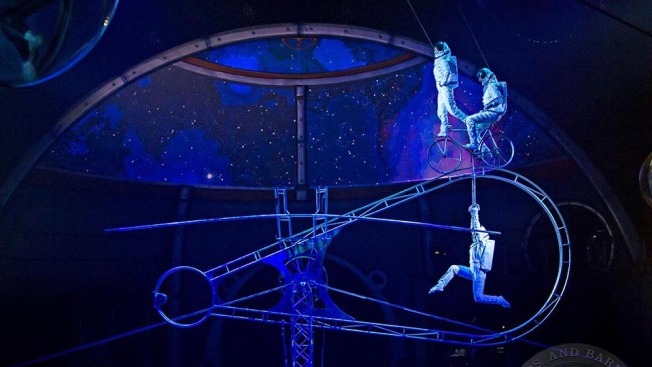 Audiences will be transported into space on an intergalactic journey that involves everything from acrobatic astronauts and ice skaters to lions and tigers, while seven high-resolution projectors create a multitude of immersive, intergalactic worlds. Watch the Simet Wheel performers embark on a gravity-defying spacewalk, marvel at China’s stilt-skating Heilongjiang Provincial Acrobatic Troupe Co. Ltd., and cheer as Ringmaster Johnathan Lee Iverson and Starseeker Paulo dos Santo battle evil Queen Tatiana on a mission to rescue the greatest and most talented circus stars. But there’s just as much going on behind the scenes at this reimagined circus. Instead of the tried and true big top music (which, let’s face it, is a little played out at this point), Out of This World is set to a rocking live band, while innovative new tech like the the spot-light tracking system uses infrared-equipped costumes to keep all the acrobatic performers in focus. In fact, there’s tech for you too. The free, all-new Ringling Bros. mobile app helps keep families connected before, during and after the show. It also allows fans to customize and share memories on social media, as well as unlock exclusive content during Starseeker’s Early Access™, a free peek backstage which starts one hour prior to the show.